UPDATE: The study was completed with an analysis of both lead-radium and bomb radiocarbon dating. Another New Zealand centenarian: age validation of black cardinalfish (Epigonus telescopus) using lead-radium and bomb radiocarbon dating by Dianne Tracey, Allen Andrews, and Peter Horn. Publication: Marine and Freshwater Research. Life-span estimates for black cardinalfish (Epigonus telescopus) exceed 100 years using an otolith counting methodology that NIWA developed. In this study, an improved lead–radium dating technique provided independent age estimates from sagittal otoliths, similar to the approach used for orange roughy. This technique used the known properties of radioactivity for lead-210 and radium-226 to determine the validity of fish age estimates. An improvement to lead–radium dating using mass spectrometry allowed the use of smaller samples than previously possible; therefore, an application was made to otolith cores, the first few years of otolith growth. This approach circumvented the use of whole otoliths and alleviated many of the assumptions that were necessary in previous lead–radium dating applications. Hence, it was possible to critically evaluate lead–radium dating as a tool in fish age validation. 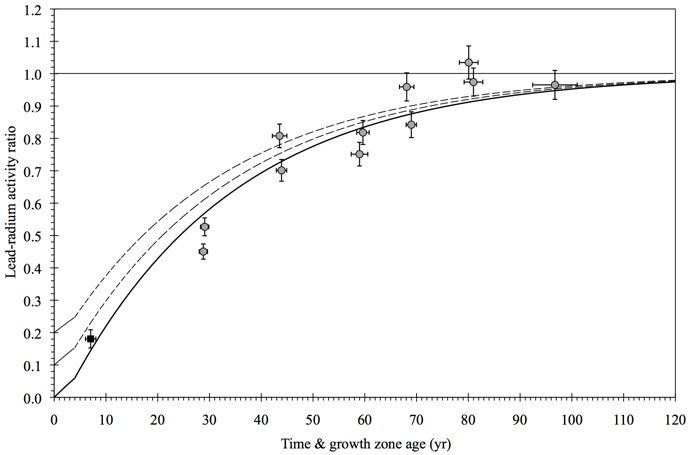 The measurement of lead–radium ratios for a series of age groups that consisted of otolith cores, grouped based on growth-zone counts from thin sections, showed a high degree of correlation to the expected lead–radium ingrowth curve (Ingrowth curve below). This finding provided support for age estimation procedures using thin otolith sectioning. As independent estimates of age, the results indicated that fish in the oldest age group were at least 94 years old, providing robust support for a centenarian lifespan. Above is an ingrowth plot of the measured lead-radium ratios measured from otoliths of black cardinalfish age groups. Note the strong correlation between the age determined from lead-radium ratios relative to the expected ingrowth curve. Minor disagreements are apparent and can be attributed to age estimation error from the growth zone counting used to place the fish into these groups. However, the extreme longevity of this species is validated by the physics of radioactive decay in the measured ratios near secular equilibrium (approaching a lead-radium ratio of 1.0). Details are available in the report noted below and in a future pier-reviewed publication. The findings here continue to address the question: Do deep dwelling fishes live longer? Grey literature publication: Andrews A. H. and Tracey, D. M. (2007). Age validation of orange roughy and black cardinalfish using lead-radium dating. Final Research Report for Ministry of Fisheries Research Project DEE2005-02, Objective 1, National Institute of Water and Atmospheric Research. I would like to add to the presentation of age data on orange roughy by introducing the late Robert Gauldie, a man that stood behind his and others perceptions of a short-lifespan for orange roughy. A short time back I tried to start a dialog with Dr. Gauldie to better understand the basis of their perspectives and it led to some interesting responses. I am still a bit confused by the recalcitrance in the short-lived orange roughy perspective, but I thought to provide the link to our last series of exchanges that are available at Dr. Gauldie’s website. RIP Bob and thank you for the years of skepticism that kept me looking to test the assumptions of lead-radium dating. My belief in lead-radium dating as an accurate tool in age estimation of fishes in more substantiated because of you. Aloha.